Fresh pasteurised sauces are liquid or semi liquid preparations served with food, principally to enhance flavour, appearance and succulence. Meals such as roast meat dishes can be too dry when served without a sauce and rice or pasta can be tasteless. 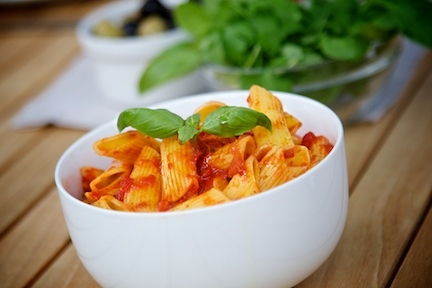 Fresh pasteurised sauces, in themselves, can be extremely flavoursome and only minimal amounts of meat or vegetables need be added to produce nourishing meals such as stews or ragouts. A number of factors need to be considered when developing new fresh pasteurised sauces. The starting point has to be what the sauce or gravy will be used to accompany. If this is meat and chicken the fat which melts out of the roasted meat (jus) forms the basis for the sauce’s flavour. If around 3% of this is incorporated into the sauce then this fat will remain incorporated with no seperation, suspended just by viscosity. This viscosity is generally provided by starches and flour (a mixture is preferable since more mouthfeel can be incorporated, but this is more susceptible to shear damage). Adding more fat means extra taste, but that extra fat can rise to the surface forming unsightly globules which are usually a different colour and can be very noticeable. A more homogenous and coherent product can be delivered by the use of emulsifiers and stabilisers which, combined with the extra fat delivers a luxuriant mouthfeel. Emulsified sauces, however, can be lighter in colour than stirred sauces. Sometimes visible fat or oil is acceptable, as in many Indian dishes. But, in this health conscious age, most consumers do not like to see high amounts of visible fat. Whatever characteristics you are looking for in a sauce, talk to our technical team – we will be happy to talk through how to achieve your objectives. Creating fresh pasteurised sauces can lead to a number of problems. Here at KaTech we can help you find the solution to these issues. When developing cheese sauces graining can sometimes occur due to the pH reduction caused by adding cheese. Emulsifying salts (phosphates) can be used to raise the pH. However, cheese has excellent buffering properties so it can be easier to match the pH of the cheese by acidifying the sauce with white wine or lemon juice. Similarly, white sauces, such as bechamel which use a lot of milk, can also encounter problems, particularly when the taste profile is adjusted with lemon juice or white wine and the milk starts to curdle. We can advise you on the use of protein protection stabilisers which act as buffers – or alternatives to using milk. Sauce manufacture can also be affected by splash at the filling heads. We can prescribe a range of filling aids (see seperate section) to ensure product homogeneity and clean container surfaces. Talk to our technical team today: we have the solution to your problems. At KaTech we have the experience and knowledge that can help you reduce your costs. One way is to reduce the visual lean of meat cuts, however, on cooking, the extra fat rises to the surface and has to be skimmed off to retain the quality of the end product. This fat holds a lot of the flavour of the dish which, instead of discarding, can be collected and then emulsified (with a natural emulsifier) with warm water to form a flavoursome white, creamy emulsion which can then be added back to the sauce (or other sauces) at a rate to be determined by colour considerations. Contact us for ways to help reduce your costs.